You’re getting dentures and wondering what it’s like to get them for the first time, aren’t’ you? Losing teeth can be a part of aging that you don’t expect. Your teeth have been a part of your physical identity for your whole life. If you begin losing them at an early age due to decay, disease, or trauma, it can be disconcerting. Don’t let the process of getting dentures put you off of these useful prosthetics. With the many advances in denture treatment and denture / implant hybrids, there is a treatment that will work for you! When it comes to the different types of dentures, every mouth has different needs, depending on shape, size, and the number of teeth missing. What works for you might not solve your neighbour’s problem, but that doesn’t mean that there isn’t a solution for both of you! The different types of dentures come in different forms, but the end goal is the same: to restore your speaking, eating, and smiling abilities! At Dentures Direct Implant Denture Clinic of Toronto, we offer several denture and implant options to fit most mouths and budgets! 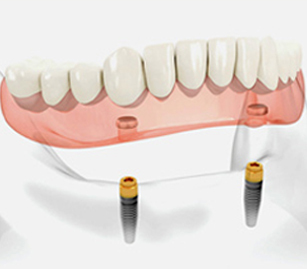 All-On Fours: Permanent Dentures in One Visit! All-on-4 dental implants, the newest dental implant techniques allow for implants and denture crowns to be fitted on the same day! We work with some of Toronto’s best dental surgeons to place four to six implants in your jaw. Then, while you’re waiting, we make your new smile at our in-house denture lab. You might come in without teeth, but you’ll leave with a full smile! Getting new dentures can fill a person with anxiety, but it doesn’t have to! If you’re not ready to have an All-On-Four implant, but you need something more stable than a traditional denture, implant retained dentures are a happy medium. The denture itself is removable, so you can clean it daily. But when you put it back in your mouth, it’s held in by a set of implants. The abutments over your titanium “roots” snap into the denture, preventing it from moving while you eat or talk (without any adhesives.) And since the weight is distributed over the implants, you are less likely to experience soreness. 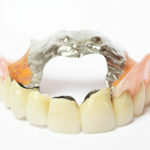 All in all, implant retained dentures are a great compromise! 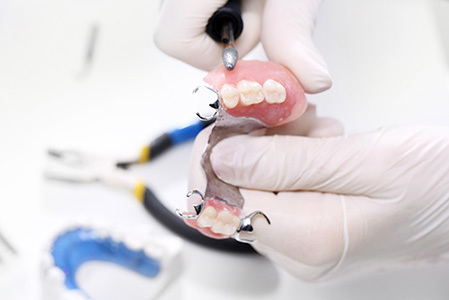 Full dentures are crowns for each tooth, set into an acrylic base. For upper teeth, the base is held on by suction, as it covers the roof of your mouth. 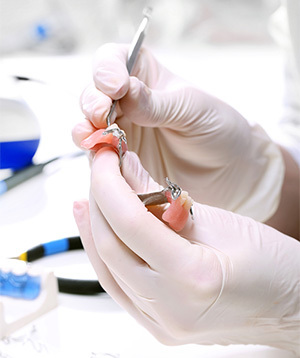 For lower teeth, the denture may be held in place by a small amount of denture adhesive. The Toronto Denturists at Dentures Direct Implant Denture Clinic will create a denture that not only looks natural, but more importantly, feels comfortable. Your dentures will need to be cleaned daily with denture cleaner (not abrasive toothpaste or harsh chemicals) and a very soft denture brush. Soak them overnight. You’ll also need to take care of your gums, cleaning them gently, and noting any sore spots. A tender or raw place on your gums can indicate a poorly fitting denture; you’ll need to call our clinic to have it re-fitted or adjusted for added comfort! Sometimes, especially if you’ve experienced a traumatic injury, a couple teeth will be missing, but most are still healthy. In this case, we can offer a partial denture. Partials are like a removable dental bridge. They stay in your mouth with the help of a retainer-like piece that is part frame and part acrylic base. Like a full set, you’ll need to remove your partial daily for cleaning and storage. Pay special attention to cleaning the gums under the partial as well as the teeth that are on either side! Make a Good Impression! We’ll need to take an impression of the gums that will be supporting the denture. This will allow us to make the prosthetic to fit well with your unique oral anatomy. Line It Up. Whether you’re getting both upper and lower dentures or just one or the other, they need to line up properly within your mouth: not just for function, but also so they are aesthetically pleasing. We’ll adjust them to fit your bite and the planes of your teeth. Install your new denture. Since all our work is done on site, there should be a short time between your first fitting and receiving your denture. And if you’re getting All-On-Four treatment, you’ll be able to walk out of our clinic on the same day with new teeth! The younger you are when you lose your teeth, the more jarring it can feel like. But that also means the longer you have to learn to use and be comfortable with your dentures or dental implants. 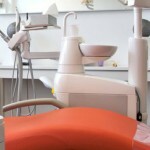 What about getting dentures at 30? At 30 years old, you’re still in the prime of your youth, and it may seem desperately unfair to lose your teeth. But the quicker you have them replaced, especially with an implant retained denture, the better your prognosis will be. When you go through life without teeth, your jaw begins to lose density and your facial structure changes. Receiving implants will protect your jaw bone and keep you smiling beautifully for many years. In your forties and looking at getting dentures? You’re not alone. Lots of people are getting dentures at 40 and beyond, but you can’t tell it because their smiles look natural! When you’re ready to get your smile back, contact Dentures Direct. You’ll find that the cost of getting dentures is less than you think once insurance is included! To be fair though, getting new dentures saves so much more for you than the amount you’ll pay for them. You’ll be able to chew your food (read more about Learning to Eat with Dentures), talk more freely (after a little practice,) and to smile without feeling embarrassed over your missing teeth. Call to find out how the Denturists at Dentures Direct in Toronto can help you! What is a Denturist?Dentures Can Make Your Smile Beautiful Again!